Network management is a complex topic, but Loran Technologies Inc. says it has reduced the arcane science to the level of a network appliance. Loran Technologies' Kinnetics Network Manager displays real-time SNMP statistics alongside a network map. The hardware appliance is priced at $31,050. Loran claims you can simply plug its product into your network and begin managing it. To my surprise, I agree. In my tests, I found the Kinnetics Network Manager appliance able to accurately discover, map, monitor and report on small to midsize networks if those networks consist of Simple Network Management Protocol devices. 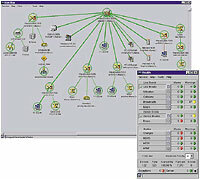 Kinnetics Network Manager 3.0 is a computer hardware unit running network management software and Web server software. You access the management software's reports, network maps and other data via a Web browser such as Microsoft Internet Explorer or Netscape Communicator. I installed Kinnetics Network Manager 3.0 on my lab's three-segment Fast Ethernet network. Data Service Unit and SNMP-manageable hardware probe. In each test, I looked at Kinnetics' ability to discover my network nodes, manage those nodes via SNMP, help troubleshoot problems and report on the network's health. For SNMP networks of fewer than 5,000 devices'routers, switches, hubs, clients and servers'Kinnetics turns network management into a simple process. It successfully discovered, mapped, monitored and reported on the network in a series of comprehensive tests. But for larger networks, using multiple Kinnetics appliances isn't helpful because the units do not coordinate with each other and thus can show only partial views of an entire network. The Kinnetics product is simple to use, but acquiring it isn't an off-the-shelf process. You must fill out a six-page pre-installation questionnaire before Loran will send you a unit. As you look over the questionnaire, you begin to see how Loran's engineers have been able to grasp network management. In answering the questionnaire, you give Loran such vital statistics as your IP addressing scheme'static or dynamic'the identity of your default gateway and Domain Name System servers and whether the Kinnetics unit will be Internet-accessible. You also report on how many subnets you have, the community strings you use, a phone number through which Loran can dial into the Kinnetics unit for support purposes and the ranges of IP addresses the Kinnetics device should explore as it discovers the network. Additional information includes the types of physical media and the brand of file server software you use. Loran configures a Kinnetics appliance with this data and ships the turnkey product to you. A Loran systems engineer usually accompanies the unit to help make sure it's installed correctly. After I plugged in a unit and gave it an hour or so to ping and poll its way across the network, I used the Kinnetics browser-based interface to view a network map, set thresholds for alarms and produce reports. The unit gleaned its network topology information from SNMP Management Information Bases (MIB), Address Resolution Protocol caches, bridge and router tables, DNS messages and port-by-port traffic analysis. Tests showed it correctly handled MIBs from many, but not all, popular network devices. But Loran has a formal procedure for adding support for a customer's devices if they aren't already provided for. Network utilization wasn't an issue, rising an almost imperceptible 1 percent during the Kinnetics discovery process. The unit itself looks like a slim desktop PC. It has network cable ports, a VGA connector, floppy disk drive and other PC features, but the keyboard port ac-cepts only Loran's calculator-sized numeric keypad for direct entry of Kinnetics parameters. Because the unit arrives preconfigured, you rarely use the keypad. I used the Kinnetics Web browser interface for virtually all access to the unit's parameters, status information, network map and reports. For each SNMP-aware network node it discovers, Kinnetics records the unit's network address, device type, vendor ID and model information. From this data, Kinnetics prepares Web pages containing network maps and reports. The real-time, interactive network map is Kinnetics' strongest feature. Java-based and displayed in a Web browser window, the network map let me drill down via point-and-click to access SNMP MIB detail for all the devices Kinnetics could see. Its graphical rendering of subnets was sluggish, but not unacceptably so. A number of Kinnetics' reporting tools are quite useful. The Network Early Warning System contains extrapolation algorithms that produce network usage projections for capacity planning. These projections, which appear on the network map, pinpoint network bottlenecks graphically and unambiguously. Another report, the Automatic Break and Fault Finder, identifies link, port and device failures, while the Network Health panel shows an overview of networkwide conditions. For the alarm thresholds I set, Kinnetics both e-mailed and paged me to report when a problem had occurred. Kinnetics' real-time reports delivered other up-to-the-minute views of the network, including traffic prediction, performance, frame relay link status, server status and desktop client connectivity. The frame relay report's display of availability and bandwidth utilization also offered helpful recommendations for changes in committed information rate. Of course, with its plug-and-play approach, installing Kinnetics is child's play, and the product's documentation is excellent. I consider the unit a bit pricey, but it does come with on-site training. If your network is reasonably small and consists of SNMP-manageable devices, you may want to look closely at Loran's Kinnetics network management appliance.